It's too small! It doesn't have a screen! It's only got 2GB of storage! Naysayers, be silent: the Shuffle, the runt of Apple's iPad litter, has earned rave reviews since its release in September. The fourth generation of the bite-sized music player ditches the most complained-about features of the previous design  mainly, a matchstick-skinny form factor that relegated manual controls to the headphone cord  while keeping VoiceOver, a computerized speech program that can tell you what you're listening to in 25 different languages. 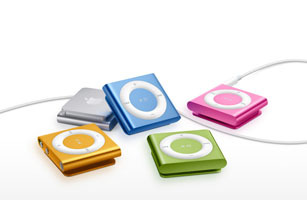 The postage stamp-sized device features a miniature version of the iPod's signature clickwheel interface and comes in a variety of colors. Plus, it's less than fifty bucks, so if you can't decide which trendy metallic shade your beloved would prefer, you can always get two.